The car showed battery light, CEL and all other instrument cluster lights, I pulled over, turned the engine off and it would not start. The battery was discharged. I took the car home and recharged the battery. The battery is able to run high beams light for 30+ mins when fully charged. The voltage after overnight charging is 13.2V, after power load - 12.5V. Now, when I start the engine, the voltage drops to 11.9V, so the alt is not charging. Further tests. When the key is in On position - battery light is on, the light turns off after the engine is started. Ground - checked PPF, all ground connections, some took apart, cleaned and put back together. Just to be sure, bypassed the ground altogether by connecting battery (-) to the engine block with jumper cable. That did not help. Alternator - installed fully, tightened belt, the pulley is confirmed spinning when the engine is running. , but my symptoms are a bit different. I do not have a full power loss in either of the regulator circuits. Another observation. If the car is running at the fully charged battery that has a battery charger attached to it and supplying 12V/5A, I can see the battery voltage start going up to 14.5V. 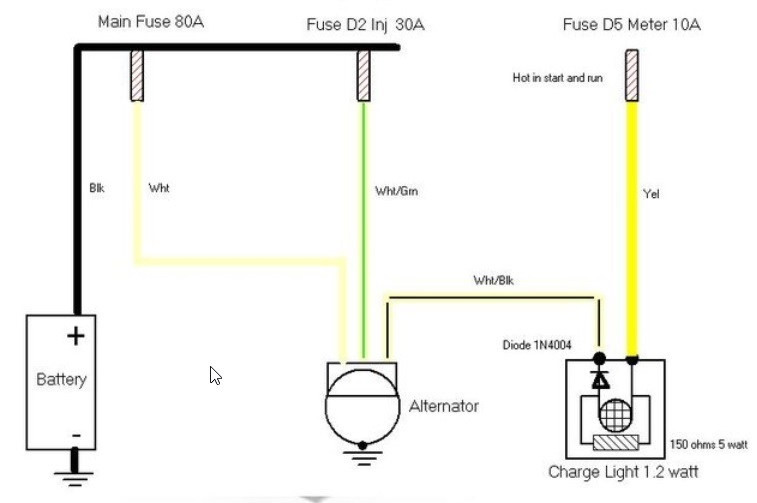 Where can I get the wiring diagrams to run the diagnostics as it was shown on the video? BTW, the car has a non-working power antenna, also some other minor intermittent electric problems. Last edit: 31 Dec 2018 16:57 by Vlad1. Replied by Desmond6004 on topic Alternator not charging. Is the positive at the alternator good? Your main positive cable might have a blown fuse in the circuit. Check it at the alternator. Replied by Andy.MacFadyen on topic Alternator not charging. I see 4 possible causes some simple checks with a voltmeter and tungsten test light first but I think you will end up with a rebuilt alternator. The early MX5/Miata/Enos was fitted with an alternator that is a bit undersized by modern standards however it is a very simple system. First test is unplug the 3 pin connector on the alternator and check for battery voltage at each of the three terminals in the plug. Both the White-Green and the White should be live with the ignition on ---- if not check the 80a and 30a fusse and for wiring damage or connector corrosion between the plug and the fuses. Next with it still unplugged and ignition on test for near battery voltage on the black-white wire --- I would also do this test with tungsten test light --- which should glow dimly. Replied by Tyler on topic Alternator not charging. Sorry I misunderstood your intro post. You're clearly on top of things, as far as testing! At the risk of differing from Andy (who is a sharp cookie), I think you're done. You need an alternator. It has everything it needs to do it's job, and still isn't. Your testing shows a working light circuit, a working regulator power circuit, and no opens in the main power or ground to the alternator. The only part that might suggest an issue is the change in voltage you saw on the white/green wire. A drop of 1V over a Main Relay circuit isn't great, obviously. But the 11V you saw should be enough to run the alternator regulator. It doesn't help that the alternator isn't charging during these readings. If you still have doubts, you can take a jumper from the white cable to the white/green wire and see if it makes any difference. If it does, we can dig deeper into the Main Relay circuit. If it doesn't, you still need an alternator. Replied by vinnyAudi on topic Alternator not charging. As Andy said, I think the best course.of action if so checks out is to supply the alternstor with a signal. If it does not start charging, you likely need a new alternator. If it does, you have a circuit problem. Replied by Vlad1 on topic Alternator not charging. So again, the voltages are taken at the terminal of 2-wire plug, (not the alternator coupling terminals). Also, the voltage on the solid wire was taken while it is attached to the alternator. The plug is disconnected from the alternator and measured, white wire is connected to the alternator while measured. The number in red looks suspicious to me, my understanding it should be around 1V when the engine is not running, but I am not confident if this "around 1V" is obtained from the B/W wire while it is connected or disconnected. When the plug is connected, I get a bit less than 1V on the B/W wire (key "on", engine off), through the sewing needle with which I tapped the wire. Last edit: 01 Jan 2019 21:19 by Vlad1. That's my third one... Got one from acdelco, not charging. This one Mazda rebuilt, made by Mitsubishi. New in box from ebay. Not charging. Not to mention the one that died and started my whole journey. That one lastx for 2 years, but itself was a third replacement for the one that came with the car. My Miata seems to be eating them. You might be right though. I'll wait until testing with tungsten wire circuit tester and only then will give up on it. Replied by BobbyM on topic Alternator not charging. Can you try the test that Paul does in this video at the 12 minute mark. 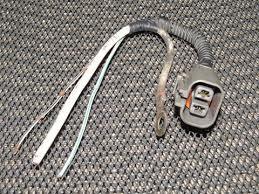 Take a test light to battery positive and with a t-pin, back-probed on the white black wire, touch that wire with the engine running and see if you hear the alternator kick on. Last edit: 02 Jan 2019 10:36 by BobbyM. It seems to be an issue on these early MX5 cars, probably the 60 or 70 amp alternator is supplying near its max output on a high revving engine. If it were mine I would check on the one make sites for an easy upgrade to say a 90 or 105 amp unit. 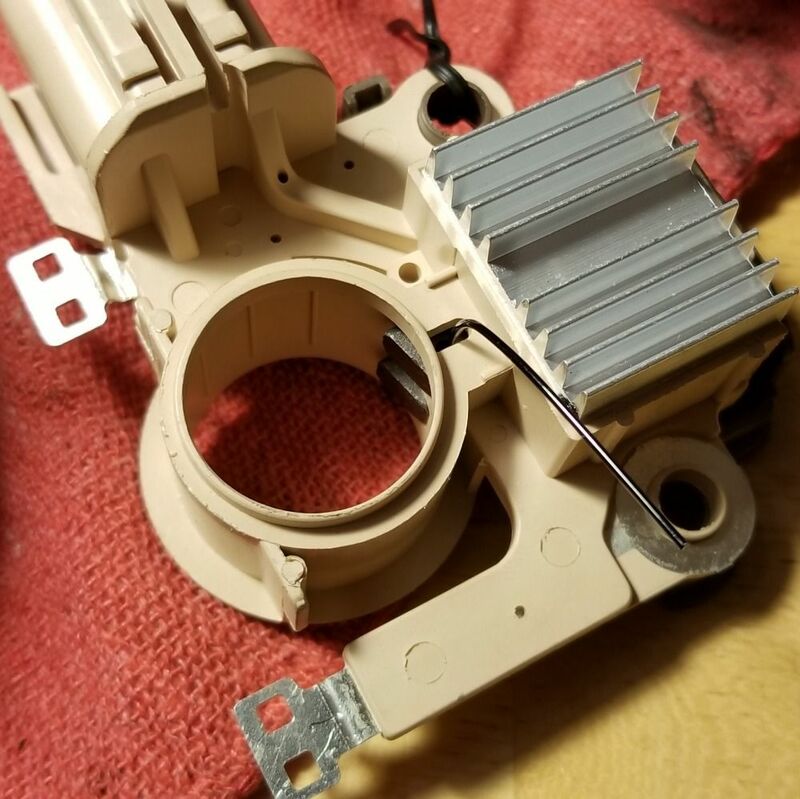 It is a fairly standard 3 wire alternator complete with regulator, if you can find an alternator that will accept the v pulley and fit the mounting brackets it should work. Last edit: 02 Jan 2019 15:28 by Andy.MacFadyen. Just did it. No change and the system voltage does not go up. So, you think alternator is dead? There was something else that helped (I was not able to monitor the alternator sounds since I had to go inside the car to start it so I'm not sure if this really is an alternator waking up. ut if not, then I have no explanation for what I am writing below). then the alternator seems to wake up and the voltage goes up to ~14.1-14.5V depends on revs (and this means yes, the voltage starts responding to the engine revs). If I unplug the charger, nothing changes immediately, but in around 3-5 mins the voltage goes down to 12.2-12.3V range and and does not elevate in response to engine revs. Thank you for the answer. So, this is what this alt needs, right? I've never done alternator overhaul. Do you think it's going to be like an easy swap? Taking the alternator apart was not hard. What would be the way to test the voage regulator and/or diodes? I want to understand what failed in my alternator and that I'm placing the working replacement. 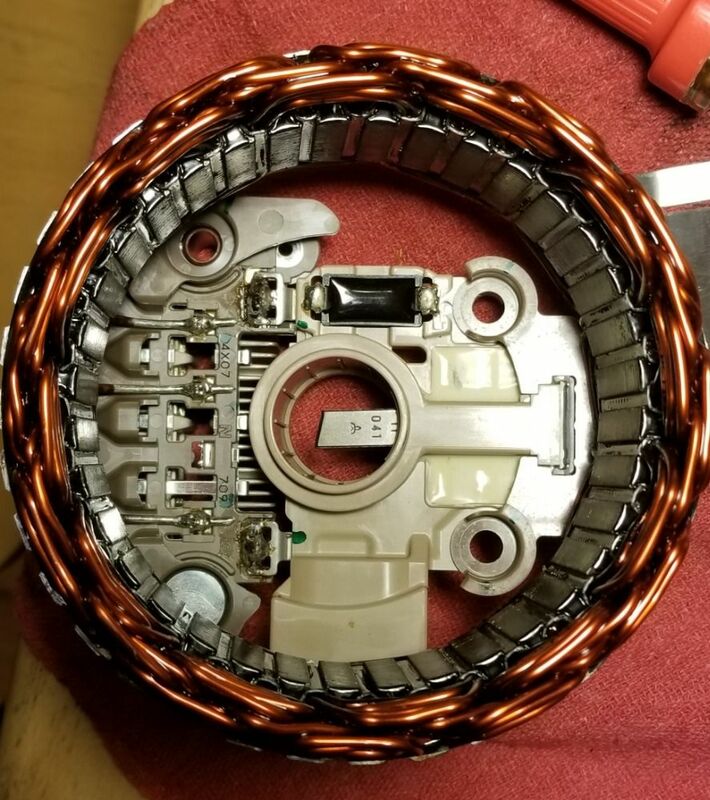 These are the pictures of the stator and electronics inside and new part that came in. Replied by juergen.scholl on topic Alternator not charging. The rectifying diodes you can check with the diode function of your dvom. Put one meter probe on the positive outlet post (where your "thick" white cable was connected and the other lead to the diodes themselves, one at a time. There should be flow into one direction and no flow when you reverse the probes. Any diode that allows current to flow in both or no direction is at fault and you will have to replace the rectifier as a unit. 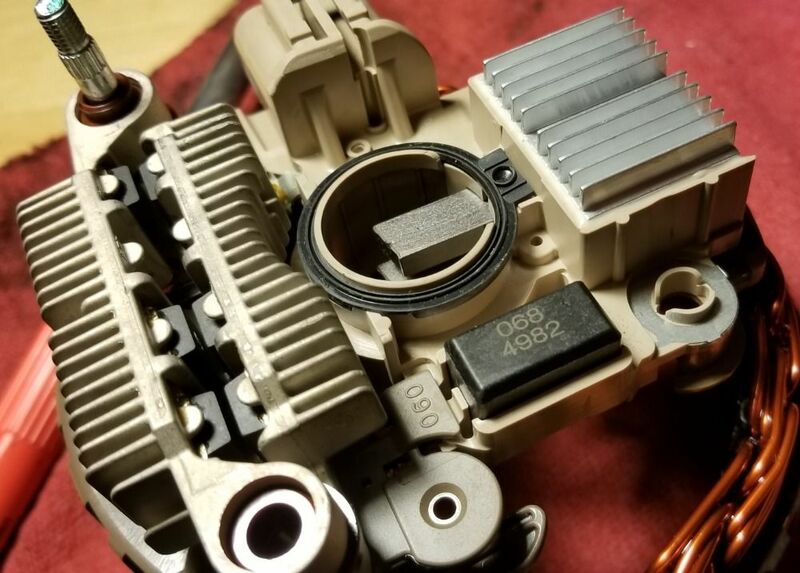 With the rest of the alternator confirmed healthy you can check the regulator IN the car by applying varies voltage levels to the control wire. The alternators output should respond if it is sound. I wasn't able to clearly find both poles of the diodes to test. One was obviously a soldered spot with the coil end. There were no other contact spots, other than the radiator into which they were pressed into. However, I think I found something that looks like potential culprit. On the new regulator, there's continuity of the top most brush to the metal contact seen on the low left side, see the picture below. In the non-working alternator, the same path shows no conductivity. Which way is it suppose to be? I am hesitating because 5he original voltage regulator looks more advanced than the replacement one (check the pictures in the previous post). And there are other soldering spots which purpose I cannot understand or guess. Should this circuit be conducting, like on the replacement part or is it going live when I supply the regulating current?